I recently wrote an article for Adweek that discusses how to experience surrounding a video is just as important to the success of the video as the content within the video itself. For those of you who haven’t caught it yet or simply don’t have any free Adweek articles left for the month, we decided to republish the article below. Brand websites were once clunky and ugly creations. Back in those early, pre-Y2K days of the internet, the web user experience (UX) resembled the equivalent of a Yellow Pages directory imported onto a computer screen. Over time, digital marketers and advertisers committed enough resources to develop their websites into sleek, beautiful and intuitive tools. Now change is in the martech winds yet again. Thanks to the rise of digital video, the web user experience qualifies as a viewer experience (VX). As Thinkmojo CEO Yann Lhomme wrote, video and its attendant assets – music, voiceover, graphics and text – symbolize the brand itself, when previously it had been defined by the functionality of a brand’s website and mobile app. The proliferation of screens in our lives means video can be consumed on television, desktop, mobile and tablets; in social feeds, on websites and in mobile apps. Each one of these devices and channels drives a different VX, as people interact with those platforms uniquely depending on such variables as time and location. This requires further thinking about the placement of the video, with appropriate adjustments in its content and presentation. One major trend in mobile is the blurring of video content and an app user interface (UI). Snapchat and Instagram Stories, for instance, embrace the vertical aspect ratio in the design of its content. Now brands create experiences tailored to that format, combining video elements with static overlays, splitting the screen in unique ways and making “swipe up” interactivity a part of the video. Another prime example of the video-UI hybrid is the quizzing mobile app “HQ,” in which a live presenter asks trivia questions, a la classic TV game shows, but with interactivity enabling viewer responses. Clearly the time has come for brands to create helpful, valuable video content relevant to their customers, transforming the video VX from a passive experience to an active involvement. Have you ever been to a website to search for something, only to receive a laundry list of answers you have to comb through one by one? Today, many search results are AI-driven, so the most common answer bubbles to the top. When video is applied to this experience and is the first piece of content served to the viewer, it can be interactive to enable personally relevant content — the viewer can indicate the nature of their inquiry and a video guides the viewer to a solution or stimulate a call-to-action. 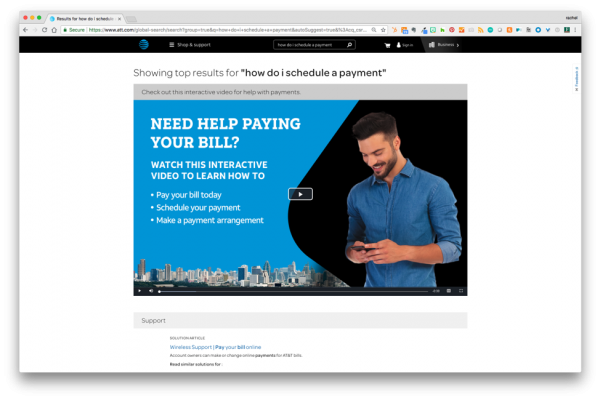 For instance, a customer who searches the AT&T site for such terms as “how do I schedule a payment” receives an interactive video experience that promotes online payment. Taken a step further, if this experience was behind a post-authentication login within the provider’s account portal, the video content can be personalized to the specific customer’s account, referring to his or her payment dates and payment amount. Financial institutions, insurance providers and healthcare insurers typically offer complex products and services that easily confuse new account holders, policyholders and members. Consequently, many of these organizations tend to go overboard with new account information during the onboarding process. Ideally, onboarding videos should be targeted and prioritize answering the specific questions of an individual customer, helping to achieve his or her own goals with only the most salient details specific to the viewer. Personalized video is ideal to simplify such complex topics, but the video content cannot — and should not — be the only dynamic component of the viewer experience. The landing page in which the personalized video resides should also be a living asset, responding and reacting to the content and the viewer’s interactivity. For instance, the video can open with an inquiry to the viewer about what is most important to him or her, and the rest of the video content can prioritize topics from the viewer’s answer. Chaptering the videos enables the skipping of topics, depending on the relevance to the viewer, while chapter titles and interactive buttons appear on the landing page around the video player, in conjunction with scenes to allow for further consumer interaction. In such a use case, a landing page contains some advanced UI elements which directly connect to the video and drive the nature of its content. By designing a complete experience and having the elements complement each other and prompt actions, a brand offers a richer, more compelling VX which responds more immediately to the needs and preferences of the viewer. Digital channel placement is just as, if not more, important in terms of contextual relevance for a consumer as is the content of a personalized video. When a video is easily accessible within a consumer’s account portal, it gets placed at the optimal channel and touchpoint when the consumer needs it most. It could be found in an airline mobile app to notify a passenger 24 hours in advance of when flight check-in occurs. 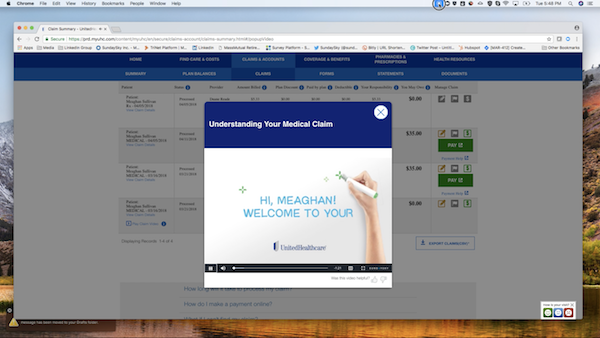 If a healthcare patient has a recent medical claim, a video explanation of the claim will be available in the patient’s account portal of their healthcare provider. A scene library enables scalability, with interchangeable assets that vary the content of each personalized video. For instance, an explanatory video of a claim may be offered for the first claim of the year, while another video would be generated for patients on an ongoing basis if their claims are regularly greater than $100. A brand may want to deliver personalized video across multiple channels, offering messaging that functions both separately and concurrently, while deepening the level of personalized content as the consumer advances with the brand. For example, a personally relevant video on Facebook serves as potential for an advertising messaging, possibly for a loyalty program, or even the availability of personalized content on a viewer’s account. If a brand wants to promote the download and usership of its mobile app, personalized video can promote that message, but a brand may also use the app itself as a delivery mechanism for personalized content. The cross-messaging and cross-platforming approach tells a sequential story which produces a call to action. As the above examples indicate, any touchpoint where customers natively interact with a brand has the potential for personalized video. In the emerging age of VX, it is no longer enough to take a video created for one medium and repurpose it across channels. Today each channel — and each interaction — needs to be designed with the viewer’s mindset as a prime criteria. The power of a scene library approach and personalization makes it easier than ever to achieve this tailoring in the most scalable, effective way possible.